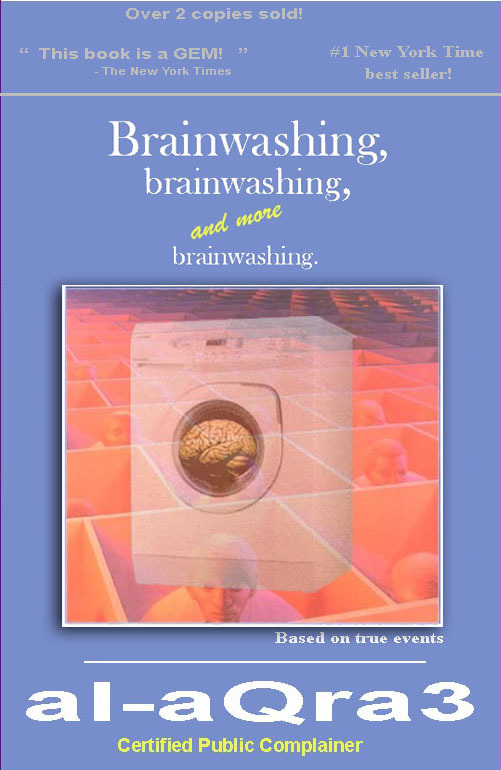 محمد اليوسفي: Would you like a Caff'e Latte with that Brainwash? 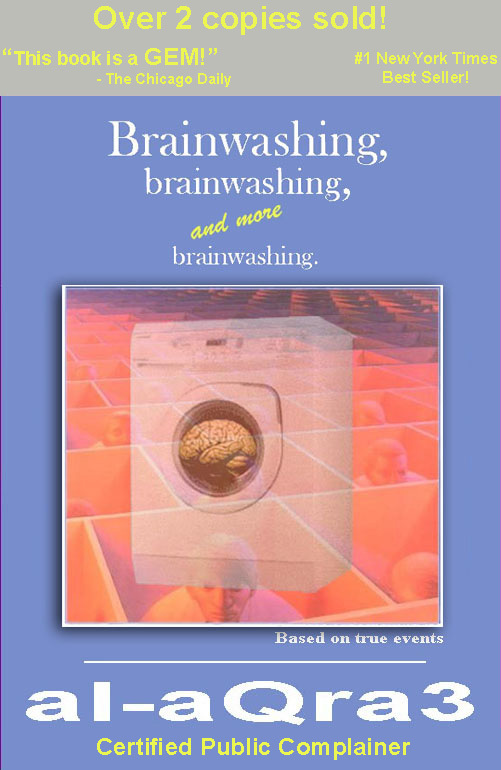 Would you like a Caff'e Latte with that Brainwash? Chapter 5 in my last post was about “عاشوراء” and “الحسينيات” (very basic English translation of HUSAINIYA: A place where Shiite Muslims relive, yearly, the tragedy of The Prophet's grandson, in a period of 10 days). Fearing that that subject would start a debate between the extremist readers, I chose not to write it. But since my colleague here opened that can of worms, I think it’s the only right thing to do. Many friends advised me not to write this post, saying that a Shiite writing about his faith in a negative way will not look good. There are people practicing other Faiths of Islam that can’t wait to use this as an opportunity to attack Shiites. There will always be ignorant fools that can’t think of anything else better than attack others so they can hide their insecurities. I am writing this post as a gesture of good will. If I am brave enough to admit (of course, in my own opinion. Many Shiites think I’m nuts and denounce me as a Shiite for that matter) that there are things I can live without regarding Shiites and there are things I believe need improvement, I am sure some practitioners of other Faiths and Religions will be brave enough to admit shortcomings from their side as well. Like Martin Luther the King, I HAVE A DREAM! And that dream is that we all wise up a bit and reach a common ground of sense and sensibility, of reason and wisdom, and only then can we fulfill our roles as human beings. Remember Braveheart (the movie, you’ve all seen it, if not, shame on you!). Now, try to remember the last 10 minutes of the movie, the sad part, the crescendo, the climax of the story. The part where most of you cried (there’s no shame in it, I cried too), or at least ended up with eyes all misty. Now imagine that part retold over and over and over and at different places. And as if that’s not enough, the events of that 10 minutes are reshaped, added upon, dramatized even more, and is made into 10 hours of sorrow, sorrow, sorrow… You’d start hearing some crazy baloney!! Every year the story is retold a new and improved version comes out. Why? So the crowd can have a reason to cry. I wonder if those people listening, between themselves, know that these are just stories, or do they really place the credibility of the “story teller” before their intellect and IQ? Don’t get me wrong, I’m sure the basic plot of the story is built upon real events that occurred some 1300+ years ago, but come on! Being gullible is one thing, and believing everything you hear is another. Refer to a part about The Criers in one of my earlier posts. It is the same thing here, some people start crying before the story teller starts. And if the story teller deviates from the norm, and actually gives a lecture that is for once, interesting and educational, people would request that he is changed, “he doesn’t make us cry” would be their reason. When I complained about the criers, someone replied that it was ok to cry, actually it is preferred, because the Prophet (S) cried when he was foretold of what will happen to his grandson. “Because The Book says you cannot”. Isn’t it obvious people? Why are there only a few that see what is happening as what it really is. A well mastered art of keeping power and authority, a beautifully laid out plan to make sure power doesn’t slip away from their hands? (I feel like Dan Brown, only he writes best sellers). I’m going to propose a theory. We are conditioned, since birth, to believe that the Quran needs further explanation, that the need for people to spoon-feed us what the Quran means is necessary, in fact, it is the only way. I think, actually I believe, that God didn’t run out of ink, or words, when God decided the contents of the Quran. Maybe some parts are meant to be open, flexible, a gray area, because they are. There is no need for a succession of power. There is no need for the continuity of separation between masters and slaves… shepherds and sheep… brain washers and brain washed. But you’re not dumb, you can foresee things like that occurring between time to time, the occasional uprising. So you implement safe guard measures. You start weeding out any possible brain activities that do not super impose you as an authority. And as any smart person (or group of people) would do, your solution would play out on all levels possible. Become a “source”, and then attack the credibility of all other sources. Condition people to become followers and have you as their only source. Eliminate their thought processes by mindless stories that not only do not challenge their intellect, but rather subdues it. Stories that they have to be ignorant fools to believe, but how can they not believe? Their faith would be in question if they don’t believe. And of course, just as “You” figured, Faith wins over Intellect. I once asked the reason why we have to use “them” as sources, and was answered that just as in medicine, if you’re sick you’d go to the doctor, and if you need answers regarding your Faith, you go to “them”. Well now-a-days it’s normal to go ask more than one doctor about your condition, and if that doesn’t suit you, you can seek out unconventional medical advise, like herbal medicine and such. O’ and now it is commonly believed that it is all psychologically interrelated. Meaning even your health is partly affected by the way your psyche works… which translated into the statement that sometimes even doctors don’t hold the key to your problems, only you do. Since “they” brought up the medical comparison issue, isn’t it logical that you hold the key to your spiritual issues as well? But without touching his darkness…! If you think it's really dark, or he is lost…! But May be you still don't see the light…! Again as I commented in the Kila ma6goog Blog let see the roots of the trees & let see the philosophy of believes with out what people do. "HUSAINIYA: A place where Shiite Muslims relive, yearly, the tragedy of The Prophet's grandson, in a period of 10 days", end quote. That, sir, is incorrect. It is not just for "a period of 10 days" - nor does the "battle" take place on a 10 day period - and many Husaineyas proceed (as they should) well into the month of Ssafar. I.e., it is not just a place to 'relieve the tragedy' of 3ashoora', that is just one part. An annual event, yes. But it is neither restricted nor excluding everything but that. The only reason you think it is for 10 days is because that is what is believed commonly (and incorrectly) among the public (of both sects). Suggesting that you, sir, are not, or show to be not, aware of the fact that "il 7saineya" is a place primarily for mo7atharaat deeneya about everything: politics, faith, a7kaam, history, and topics of the like. Especially in this day and time, since you do mention that we are talking about something that had happened some "1300+" years ago. I feel it is necessary to establish that you prove to be not as well informed (lack adequate research perhaps) as one should be in order to present an acclaimed analysis. "Now imagine that part retold over and over and over and at different places. And as if that’s not enough, the events of that 10 minutes are reshaped, added upon, dramatized even more, and is made into 10 hours of sorrow, sorrow, sorrow… You’d start hearing some crazy baloney!! Every year the story is retold a new and improved version comes out. Why? So the crowd can have a reason to cry." If you thought people cried for the actual slaughter, then you, sir, are gravely mistaken. Sure, it was a disgusting display of all that was wrong and immoral, and the battle has witnessed tactics never used before in history. Two very straightforward examples: no water for the women and children; as well as the crushing of bodies with the horses after the slaughter. Be that as it may, that is not what makes people cry. Sure, some scenery is dramatized, but that does not make it a lie. For example, it is known that Il Imam did not bare to carry the body of his brother, 3abaas, back to camp. Therefore, you see it being used as a metaphor: "Hussain felt his back break when he saw 3abaas' body". There is no deception, and there surely is no lie. Only scenery. Then again, that is not what makes the people cry. "I wonder if those people listening, between themselves, know that these are just stories, or do they really place the credibility of the “story teller” before their intellect and IQ?" What exactly is it that you do not 'believe'? If a scene is displayed showing that a 4 year old cries at the body of her uncle, and "it3aatbah" for not bringing her the water he promised; that is just to show the symbolic presence of the dead uncle (the water supplier, going back and forth to fight for water for the children). And the fact that the child in this case was close to the uncle + very thirsty. Again, scenery. No lies. So what is it exactly that is surpassing the IQ of the listener? Moreover, you, sir, have to understand that what makes people cry is "na3y". It is mostly poetry that is either in formal Arabic, or in the Iraqi dialect. That is simply because there are a lot of poets that are in Najaf and Baghdad and other Iraqi cities. Therefore, when the poem depicts the scene of a mother, crying over her son, the martyr; that evokes emotion. I.e., the "storytelling" you are questioning is basically poetry. Question to you, kind sir, is what exactly do you know about Arabic poetry? "When I complained about the criers, someone replied that it was ok to cry, actually it is preferred, because the Prophet (S) cried when he was foretold of what will happen to his grandson. Now of course, me being me, I questioned that statement, and the first thought that came to my mind was “according to whom?”" end quote. Those four books act as a very very good source for the Shee3a to know about the life of il naby Mo7amad - sallah allah 3laih o aaleh - and their Imaams. When you ask "by whom? ", you are asking about the men (or women) that have said so, and who is it that has REPORTED that. This is where you, sir, are introduced to علم الحديث and علم الرجال. If you would like to know "who exactly has reported that 'story'", you can ask someone whom you trust to have been thoroughly through the books, and can bring those sources and show you. A Sheikh is the easiest step, you just tell him "I am not convinced with so and so", and then he is obliged to get you his sources. You, sir, after inspection of those sources (the men, and their history), make up "your mind" as to whether or not it is true. Sitting here and just thinking "oh well, it sure does sound like a lie" goes to prove, let alone SUGGEST, nothing I'm afraid. That is if you were to consider yourself, sir, a 'somehat' of a scientific person, as opposed to being a passer-by with arbitrary intutions. Per se. "Imagine you’re someone with a great lot of power, people listen to you, to what you say, they come to you for advice. Your authority (of course, your authority is blessed by God) is sometimes greater than any law. Feels great doesn’t it?" I am not sure what that exactly refers to. A sheikh who gives lectures? A marji3eya? At any rate, it is far from anything realistic. I would like to tell myself now that you are being sarcastic, and not literally believe in any of the above. Given that you do believe, sir, in what you have said literally would make you, again, incompetent to the reality of the matter. If, however, you, sir, were being sarcastic; then I assume you would have no troubles in me saying that that would not stand as anything depicting the reality of things. "Become a “source”, and then attack the credibility of all other sources. Condition people to become followers and have you as their only source." Again, I am not sure who exactly you are referring to with 'source'; but if it was a marje3iya, then your saying "Become a source", is very silly. Almost as silly as someone wanting to "Become a heart surgeon" and people would then believe him instantly and let him or her operate on their hearts. There are many many MANY steps that go into the ladder of becoming a 'source'; a marji3 in this sense; and if you did not mean that by saying 'source', then I do not see the significance of this particular "comment" in serving the purpose of your overall "argument". "Since “they” brought up the medical comparison issue, isn’t it logical that you hold the key to your spiritual issues as well?" Here, I would imagine that you are not asking about anything but el marji3. He represents knowledge in all the sciences related to il Islam. Much like how our brothers from the Sinna sect acknowlegde Shaikhs and A'emat Mesaayid as. Only the maraji3 are much much MUCH more competent. However, you, sir, must understand that this 'source' is there for any troubles you come across in terms of A7kaam il deen. Unless you would like to prove to me that you are competent in il Islam to give me an answer BASED ON YOUR STUDIES AND READINGS THAT HAVE TAKEN YOU WELL OVER 40 YEARS OF NON-STOP RESEARCH, I would rather stick to the man who has already proved that. How did he prove that you may ask. The easiest way to answer that, in a modern sense, is for me to tell you: imagine him graduating from x University under the "professors" of w, y, and z. You then have the chance to "research" and see who it is exactly that proves your intutions (realistic ones and based on what you already know), and go ahead taking him as your marje3 whom you ask when in conflict. Again, just like when someone from our brothers and sisters il Sinna says "let me ask our imaam masyed", whom well may tell him or her "Let me ask x or y who is more knowledgable". If, however, you would like to take it upon yourself that you put your life on halt: study the Qur'an and its "tafseer wa ta'weel" and then go ahead and study il feg-h and il a7adeeth and their tafseer and then the history and then the this and that ... taking you well up to 30-40 years, assuming you're a hardworker. Be my guest. And it would be a greater waste if it were dependent on no knwolegde but its own. "I think, actually I believe, that God didn’t run out of ink, or words, when God decided the contents of the Quran. Maybe some parts are meant to be open, flexible, a gray area, because they are." What exactly is it that is "grey" about that? I guess I struck a nerve with some extremists lol. How can you comment on a post without reading it completely? I'll try to say this as diplomatically as possible. 1. About the 10 days, if 80% or more do not participate in this event or ritual past the 10 days, I think i'm allowed to generalize. Thank you for establishing my ignorance. :-) Thats wonderful. 2. About the stories being dramatized. When I say that people go there for the purpose of crying, these are based on real events. 3. About the books, you just said that these are Shiite references. I guess you skipped the part about Validation. 4. About asking a Sheikh. Again... I don't wish to repeat myself. 5. About "Sources" and "Heart Surgeons". Again, really... I guess I wasn't clear enough, it's all in the post. 6. About God's Quran and Islam being complete. I can't see how this is different from what I am saying. Is this an affirmation of what I'm implying? Anyway... Isn't it proper to start any Holy Verse from the Holy Quran with a "In the name God, most Gracious, most Merciful"? PS. No need to suger-coat your insults with words like "Kind Sir" and being so "formal". Rationalizing Islam (or any other religion for that matter) is a lost cause. يقول السيوطي في الإتقان في علوم القرآن بأن العرب وهم "أصحاب اللغة الفصحى ومن نزل القرآن عليهم وبلغتهم توقفوا في ألفاظ لم يعرفوا معناها"
Failing is a relative term, no? I'm not rationalizing Islam, I'm rationalizing our psyche. I'm trying to differentiate Islam from what is falsely considered to be Islam. I do not see why people get so insulted by one man's journey for the truth? If I am wrong, then hey, the heck with me :-) One lost soul is not a big deal. ham 6ayab allah anfasik o anfasna kilna inshallah bas ya jma3a elli 7ab agola ena elli yabi yetkalam khal ekon waa3i ohwa shno ga3ed egol mo 3ashan bas abi ared 3al nas agom akteb ay shay . mako shay esma "according to me" o "kaifi" o fe grey areas aw maafi. naas 3ulama`a edresaw el qur`an wel tarekh 40 years o ba3adha gamaw yaftoon . mo e7na enye eb robe3 sa3a o nafti o naktib o 3ala kaifna o according to us. ana mo ga3ed aq9ed a7ad eb kalami la7ad yefhamni ghala6 bas ga3ed an9a7 wel na9e7a lellah sub7anah. entabhaw 7ag kalamkum la7ad yafti o yetkalam men 3inda e7na fe mawthe3 maykhawelna ena na7kum aw nafti 3ala shay. First of all, Al-Husain is a hero. When you dramatize his death, his sacrifice, into one sad story, you only diminish the meaning behind his martyrdom. Secondly, if you should cry over Al-Husain, you don't need someone to poetically induce your need to cry. I thank you from the depth of my heart for your lovely comment. I wasn't trying to be political, or slightly so. All I wanted to do, is share something that I think could be valuable to some. Anyway... this is a lost cause, I think. People are so systematically brainwashed that there are no margins for flexibility or even individual thought. So the first thing you do when someone discusses what you write, giving you the credit of considering what you had to say as something that could be expanded on, is delete his comment? There is a difference between constructive discussions and criticisms, and what you're doing. So with all do respect. I wrote my post, you commented and I replied… Obviously nothing of what I'm saying is going through you. You "Sir" are saying that you read and understood what I'm saying, and that it shows incompetence from my end. I on the other hand believe that you didn't understand a single thing I said. So why bother? There is no need to go back and forth, ballooning the comments area without ever reaching a common ground. It is clear from the get go that your way of establishing a discussion is through discrediting the other side's point of view. You should read De Bono's Six Hats… I think you'll benefit from it. PS. If you think that my words have insulted you or your belief… Remember this jingle… "Sticks and stones may hurt my bones, but words will never hurt me"
My 'comments' were actually replies to what you have already mentioned in your post. And later on in your comment here. I really don't see why, or how, you think I'm an extremist, but if your definition for being extreme is that I know what I believe in and 'actually' believe in it, then so be it. Whatever makes you happy. Your being incompetent is not an insult. It means that you lack the basic knowledge that you should have gathered from doing your own research. Otherwise, what you have to say would lack sophistication. I was merely treating it as a realistc point of view, and not just a personal rant. Straightforward example: when I told you about the four books you mentioned the validation. Baring in mind that il shee3a do not have something like "sa7ee7 muslim" or "sa7ee7 il bukhary". That basically translates into you not knowing what you were talking about. It isn't an insult, nor would I gain anything if I intended it to be one. You either did not know that, or came off as not knowing that. Mo 3aib. With all due respect, you did post and I did reply. And I replied to 7amad and Shurog too. You then just deleted it because you probably could not have replied to the (much longer) section directed to yourself. Noting that you could have kept it (for the others) and told me "I wish to not go into more detail here", and I would have taken that wa kaana allahu qaforun ra7eem. My discrediting is to that which is proven to be false. So yes, if you sir have a false idea about a reality I live, then surely your idea would not stand; and it is my duty to tell you the real meaning of the misunderstood idea. On the other hand, if what I consider to be 'fully credited' were challenged and proven wrong by yourself, I would have also taken it o kana allahu qoforun ra7eem. Deleting a comment does not do that. Thank you for the reference to the book, akhaleek tethakerny later when I have the time. Finally, in my "deleted" comment, I did ask you: who are you talking about when you say "insulted"? No, you haven't insulted myself nor my belief(s). Not that anyone can 'insult' my belief(s) anyway, and it is a given that you have not 'insulted' me personally neither. So I really don't know why you insist on my being insulted when I did say that I wasn't on more than one occassion. PS: Please do check the discussions taking place in THIS blog in previous topics; you'll see that everyone says what he wants to without it ever getting to insults. Not personal nor to the other's beliefs. احنا ما صدقنا على الله أحد يحط كومن , تقوم و تقعد تمسح فيهم! Alright… even though I'm not in the mood for this song and dance, here goes nothing. 1. With all do respect, calling someone incompetent is an insult. Lacking the "basic knowledge" is a relative term. To me you might be lacking the basic knowledge, correct? It all depends on whose knowledge you're talking about. And clearly, if you haven't figured that out in the post (which is very hard to believe since I was so obvious), your knowledge and my knowledge are in totally different realities. That is a good example of an extremist… One who believes that his/her reality is the only reality. His/her knowledge is the only knowledge. 2. About the books, here are quotes from your two comments… "Those four books act as a very very good source for the Shee3a to know about the life of il naby " and just now "Baring in mind that il shee3a do not have something like "sa7ee7 muslim" or "sa7ee7 il bukhary". All I said is that for you to refer to my Validation point. Meaning, even if the source (the books) are or are not Shiite references, it all depends on who's translating them to me. If I went to a Sunni Emam or Sheikh and told him to translate them to me, would he translate them the same way a Shiite Emam or Sheikh would? Obviously not. 3. I deleted your post for a simple reason, I didn't want to get into this discussion I'm in now. But I guess it has to be done. Insisting on my incompetence, based on your truth and your reality is another reason why I deleted your post. Just as anyone else might do if some Blog User keeps insulting them. O' and by the way, if you don't take someone calling you incompetent as an insult to yourself, I do. I don't blab or "rant". I chose my words carefully, given the occasional slip. No one is perfect. And by the way, if I wanted to erase your comment completely, it was possible, I chose to keep the fact that you did post a comment and that I delete it for a reason. 4. About being insulted… my words were "PS. If you think that my words have insulted you or your belief… "I haven't insisted on anything. It was a question, or a remark rather that is belt upon an assumption. If that assumption is incorrect, then the remark would not hold true. I have mentioned the word "insult" a few more times, but they were in a general term, now if you'd like to think that I was referring to you, then what can I do? 5. Have you heard this one… There is a "Husainiya" in Kuwait that has two floors, upper level for Women and the lower one for Men and the Sheikh. The Sheikh was talking about Halal and non-Halal meat. So he was describing how they cut the chicken, and he said something along the lines of "And they hold her head and then they bring that big knife and they cut her head" Again, with the poetry you mentioned earlier. The women started crying, thinking the Sheikh was referring to the story of Al-Husain… So please understand, everything I said here is based on observations. Ask 10 Shiite out of the blue, from the streets, if they go to Husainiya, if they said yes, then ask them how many of them stay after "3ashora" (by the way, what does the word "3ASHORA" translate into?) if more than 8 (or lets say 5, to cut me a break) said they visit the Husainiya even after the 10 days, then I'm wrong… I'm betting, that they percentages would lean in favor of my observations. "a brain is a sad thing to waste". but it's even sadder when the one who owns it doesn't know when to use it n when to let others stir its' gears for them. faith is a feild of knowledge like any other. there is an expert and a novice. some of them experts (and i stress on some) do mislead the masses intentionaly or out of shortsight. some of them novices (and again ... i stress on some) don't know that when a Sheikh's opinion is sacred, they are placing them in the same rank as God, which is ... a MO9EEBA faith-wise. al8a3ida, women wearing 3abaya by force in saudi arabia ... ripped off from their simplest human rights of having a career ... a car, committing suicide while bombing civilians and calling it "shahada", calling a person with a different math'hab a "kafir" ... yeah these are few of the shortcommings that cross my mind as a muslim in general and as a sinniya in particular. the only way to stop all that is by educating the novice about their faith and remind the expert that no one (and i double stress on "no one") is Abu Al3oraif. p.s for the couch-potato novices: if you are too lazy to learn about your religion, at least double check a fatwa before you start acting like a da3iya and spreading it around. p.s for kila ma6goog, doc: i know i've written in your blog more than i did in mine. it's not my fault! it's al-aqra3's!! although I am a sunni Muslim,, but I have no problem reading about other religions or mathahebs ,, as a mater of fact I do sometimes discus them with friends,, and by discuss I mean talking about it, not trying to convince them or prove them wrong with anything .. I believe that religion is something deep within a person and NOBODY can change that unless that person wants to ..
elmohem .. one day I was in our collage cafe when I saw this brochure about 3ashoora .. I start reading it.. and it was ok till I got to the part (be5te9ar) where profit Mohammad (S) was telling his daughter Fatma about what is going to happen to her son,, and they where crying and he said that any1 who cries like we do .. will go to heaven! I got to my friend and asked her about this.. why didn't saiedna Mohammad prevent this from happing since he knows about it? She said something about sacrifices but I wasn’t convinced .. I think that profit Mohammad could have find a way out of it bedon ma ye5aly his grandson o0o al el bait suffer that much ..
Sweet post al-aQra3. I really liked your idea and writing, very unique. Though I'm not with you 100% I still enjoyed reading your post. Thanks for writing it. 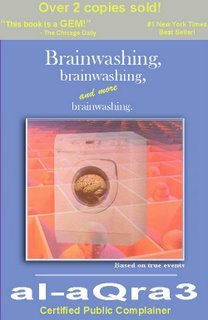 But I have a suggestion, I think the title would be a lot smarter and funnier if it were "Would you like some 'Sherbet' with that Brainwash?" Temetwir you are a very smart man walla. I really liked your replys. But you cant really convince someone as ignorant as Al-qar3a. Walla I was laughing so hard when I read this comment: "So the first thing you do when someone discusses what you write, giving you the credit of considering what you had to say as something that could be expanded on, is delete his comment? That doesn't call for much flexibility and individual thought, now does it? Sir? :)"
He sounds conceded. He only sees his words and hears his voice. A wise writer would research and find out the truth instead of asking rondom people in the mosque thinking that he has all the proofs he needs. Ignorant. Hmmmmm typical. I think he just ran out of ideas. And oh yeah, you'll never be as good as Dan Brown. Dream on. Maybe your next book should be about the hijab.